Its Coming!!! Hobie MirageDrive Reverse on 2017 models!! New Camo Colour on Popular Fishing Models!! Hobie has just announced the new MirageDrive that can change to reverse, They are calling it the MD-180. It will be standard in all 2017 models and will also retrofit into older models!! If that is not enough to get you excited they are also introducing a new Camo version of the most popular Fishing models: The Pro Anglers 12 and 14, and the Outback. In addition to the Camo finish hulls, all boats will include custom hull graphics, and custom pedal pads. The Camo Pro Anglers will also include custom floor pads; the Camo Outback will include Turbo Fins. Shallow water? No problem – you can still flutter-stroke right through the shallows — now in forward or reverse as you please! Retrofittable to all previous Hobie Mirage® products sold? Oh, yeah! 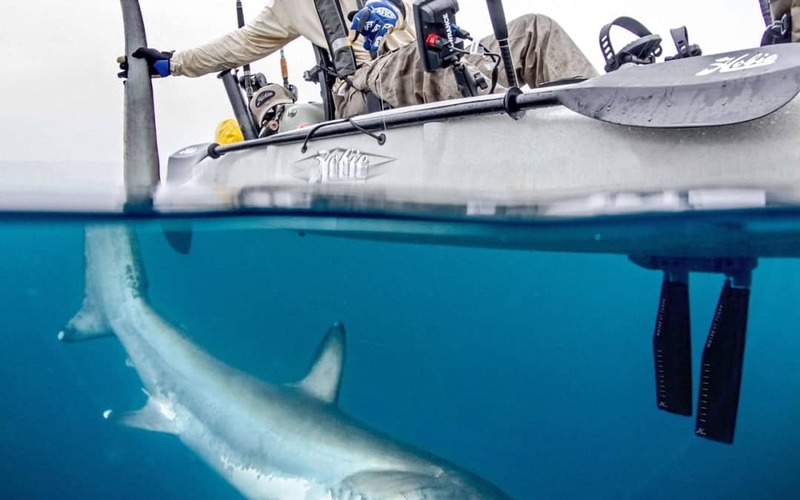 Modifications may be required on some earlier model kayaks for the proper fit. Does it fit in all Mirage Kayak models, including the inflatables? But of course! Hobie’s Glide Technology? Yep, the MD-180 still provides the smoothest, easiest ride on the water – literally gliding with continuous motion while in between pedal strokes. Click and Go Insertion and Removal? Absolutely, as easy as ever, whether the fins are in the forward or the reverse position. Performance? It’s equally efficient in reverse as it is in forward, giving the sensation of flying over the water. The all-new Fin design features great efficiency; stronger, more durable fins for even greater impact resistance; and a clean, new look. Turbo-Fin Upgrade Kits will be available in March 2017 through Parts and Accessories. It is not possible to put the new fins on an old drive because of the design changes made to facilitate reverse. The new Mast is a larger diameter, which provides more strength, with more resistance to bending on impact. If you would like to be updated with further information on these products please fill out the contact form and we will be sure to get some information to you as it becomes available.